Tourist Veronika Kashayova studied a T map in Copley Square. Thanksgiving Day will be sunny and blustery, with temperatures only reaching the lower 20s in the Boston area, and gusty winds that will make it feel like it’s much colder. The cold has led some communities to shift their traditonal Turkey Bowl games to Wednesday. A wind chill advisory has been issued for western Massachusetts for Thursday morning. The advisory will be in effect from 4 to 10 a.m. Thursday for portions of Franklin County, Hampshire County, and Hampden County, where wind chill values could drop to as low as 15 below zero. Thursday night will be mostly clear and blustery, with lows in the teens, and some locations may set new records for cold temperatures on Thanksgiving, the weather service said. The record low for Nov. 22 in Boston was 9 degrees (set in 1879) and the record minimum high was 24 degrees (in 1880). The record low for the Thanksgiving holiday in Boston was 11 degrees (set on Nov. 27, 1873) and the record minimum high was 24 degrees (on Nov. 28, 1901), according to the weather service. Years from now, people will be talking about the cold Thanksgiving of 2018 that we are about to endure. 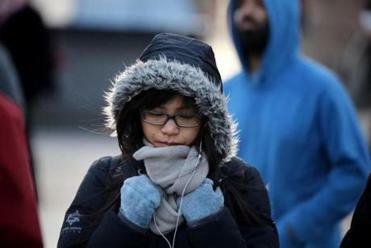 The forecasted low temperatures for Thursday include 17 degrees in Boston, 9 degrees in Worcester, and 15 degrees in Providence, according to the National Weather Service. Friday will be sunny, with a high near 30, forecasters said. We should get some relief from the cold this weekend, as Saturday will be mostly sunny and not as cool, with highs in the mid 40s. Sunday will be mostly cloudy with a chance of rain, but temperatures in the Boston area could reach as high as 50 — which will feel downright balmy compared to the bitter cold that we’ve been experiencing lately. Danny McDonald of the Globe Staff contributed. Emily Sweeney can be reached at esweeney@globe.com. Follow her on Twitter @emilysweeney.